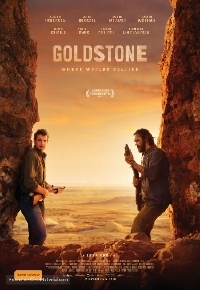 Goldstone is Ivan Sen's sequel to his acclaimed 2013 thriller Mystery Road, which introduced the world to a character called Jay Swan, an aboriginal detective who worked cases in the outback. I haven't seen Mystery Road yet, which stars Ryan Kwanten, Hugo Weaving and Aaron Pedersen, but I'm am hellbent on tracking it down now after watching this gorgeous and emotional trailer. Goldstone was recently Selected as the opening film of the Sydney Film Festival . Director Ivan Senâ€™s new feature GOLDSTONE sees the excellent Aaron Pedersen (MYSTERY ROAD, 2013) reprise his role as troubled Indigenous detective Jay Swan. On the trail of a missing person, Jay finds himself in the small mining town of Goldstone, where he is immediately arrested for drink driving by young local cop Josh (Alex Russell). When Jayâ€™s motel room is blasted with gunfire, it becomes clear that something larger is at play in the district. Jay and Josh struggle to overcome their mutual distrust to uncover the unpleasant truth. Golstone stars Jacki Weaver, David Wenham, David Gulpilil, Cheng Pei-Pei, Michelle Lim Davidson and Tom E. Lewis.